Any hopes Winter would make a triumphant return have been dashed bit by bit by our weakening but still powerful El-Nino (see January’s Factors Behind The Forecast for more on how that has killed our Winter). While you may be thanking your lucky stars this Winter has been a respite, remember many in our area depend on snow for a living, and some, including my publisher, just adore and live for cold, snow and more snow. Ski areas have struggled amidst warm and rainy conditions, those who depend on snowmobile traffic have been out of luck and anyone who plows or ice fishes hasn’t found this Winter to be very hospitable. Just a little perspective on the downsides of our mild February. The mild February has been driven at the world-wide scale by El-Nino but seeing as I’ve already covered that, I’m going to zoom in a little bit and examine a type of storm we’ve seen several times this year, the Inland Runner. An Inland Runner is a type of storm that forms in the Deep South, usually over Texas then tracks NE just to the west of or just to the east of the Appalachian Range (large scale storms hardly ever track directly over mountain ranges). They are different from Nor’easters which track offshore and are also slightly different from Great Lakes Cutters which track more towards Chicago than Buffalo. I’m going to take a more detailed look at our most recent Inland Runner which began impacting the region on the evening of the 23rd of February and finally moved out the morning of Friday the 26th. I will use this event to talk about some of the general traits of Inland Runner events and what impacts they typically bring. Most Inland Runner events this year have been preceded by very cold air. We had one following an impressive Arctic blast that even set record low temps to our south. However, just a mere day later, temps were in the 50’s with heavy rain. The 23rd event was also preceded by cold air, just not as cold as the one the week prior. On the evening of 22nd February, Arctic high pressure was strengthening as it moved into the region. Temps were in the teens and single digits. This Inland Runner event was unusual in that it had a vanguard of sorts in a weaker storm that passed offshore on the 24th. This weak storm turned winds northeasterly which helped to keep that cold air around. As it passed offshore, we saw moderate precip which brought about an inch of snow to Portland. As that storm passed offshore and the Inland Runner began moving up the Ohio Valley, we saw a lull in the precip in Portland. Farther north, a warm front kept precip going in the mountains where more freezing rain fell through the day on the 24th. This is one of the hallmarks of Inland Runner events: usually there is an initial wave of frozen precip associated with a storm and / or a warm front. Another hallmark of Inland Runner events is a lull between the warm frontal precip (frozen) and the cold frontal precip (liquid). 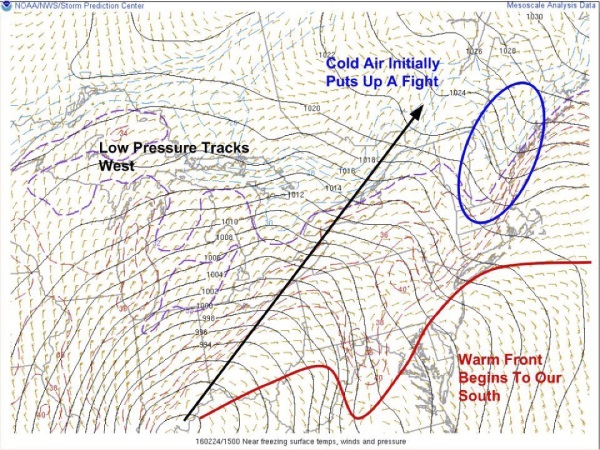 Why does the warm front bring cold precip and the cold front bring warm precip? That has to do with the fact that fronts are named after the air that follows them. When a warm front approaches, the warm air is coming but hasn’t gotten here yet meaning we still have cold in place. When a cold front approaches, the warm air has already arrived and the cold is coming, thus we see liquid precip. The cold lurks behind the cold front. In between, warm air is moving into the area but there’s nothing to make it rise, cool, and condense in an organised way. Near the warm front, there was cold air at the surface that the warm air was forced up and over resulting in precip. Near the cold front, cold air was sliding under the warm air which was forced to rise resulting in precip but in between, there was nothing to result in rising motion and so precip shut off. This is why precip from Inland Runner events typically plays out in two stages. The first stage of precip was the snow and freezing rain from the warm front. The second stage of precip was the heavy rain, high winds, and thunder from the cold front. This wave of precip was much more intense but didn’t last nearly as long. Winds ahead of the cold front were racing at hurricane force speeds just a couple thousand feet off the ground. The thunderstorms mixed down some of those winds to the surface through a process known as momentum transfer. 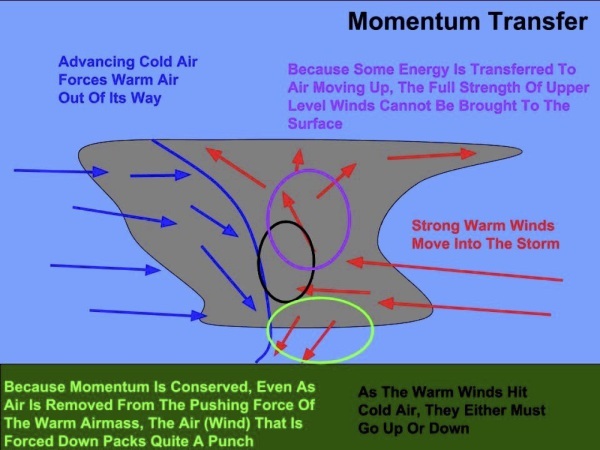 Momentum transfer occurs when warm winds crash into a nose of cold air. Think of a rock in a stream. Some water goes around the rock one way and some water goes around the rock the other way. The rock is like the nose of cold air while the stream represents the stream of warm air aloft. While some of the winds turn harmlessly up into the upper atmosphere, some are deflected down towards the surface bringing very high gusts. This process is helped greatly by heavy precipitation which churns up the atmosphere even more, resulting in more forces (downdrafts, most specifically) to direct winds downward. The crashing of the warm air into the cold air is the driver of the precip so this is a self sustaining cycle which is why lines of heavy thunderstorms can march east well through the night, even when there’s no daytime heating. Portland’s thunderstorms on the morning of 25th February formed well to our Southwest where they brought very strong winds and tornadoes to the Southern U.S. They lasted through the night and survived a journey into much more stable, colder air in New England because the force of the warm air smashing into the cold air was so great. This explains why we heard thunder even in February and even in the early morning hours — usually the time of day least conducive to thunderstorms. It also explains why, if you own a NOAA Weatheradio you got first a severe thunderstorm watch which woke you about 2 a.m. that night and were roused from slumber again with a warning for the Portland and southwest Maine area when the actual line of storms rumbled through about two hours later. As the cold air pours into the area following the cold front, things usually quiet down. Sometimes there are upslope snow showers in the mountains but usually things are pretty much done after the violent cold frontal passage. The low races Northeast through the St. Lawrence Valley and high pressure moves in. While an upper level disturbance interrupted this process in the late February event, that’s usually how Inland Runners end. So what’s ahead? As is my usual policy I don’t put anything in stone very far out (that’s what my Up Portland forecast is for every day on our website at www.upportland.com), but looking briefly towards March, Winter may have one last gasp around the beginning of the month but after that, for we snow and Winter lovers, Spring is quickly approaching, which is my way to say Daylight Saving Time begins on Sunday 13th March at 2 a.m. Set your clock ahead one hour and put those boots, boards and skis away until later this year when we can hope for a La-Nina and colder than normal Winter of 2016-17.